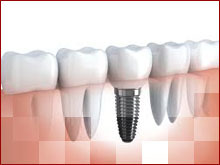 Dental implants are fixtures of titanium which are surgically screwed into your jaw bone. The implant is an anchor for a naturally-appearing false tooth or a set of false teeth. The success rate of dental implants depends on where the implants are placed and their purpose. It is important that you have enough bone in the area of the missing teeth for the implants to be attached to. Implants are not only used to replace one tooth, but rather people missing most, if not all, of their teeth benefit greatly as well. Implants are increasingly being used to replace certain types of bridges and removable partial dentures.